I agree with the first part of Lucas' statement, but that road jersey is absolutely gorgeous. The primary set is inspired by their previous set. Alternate is based off the old navy alt. Also features sublimated checker pattern between the stripes. 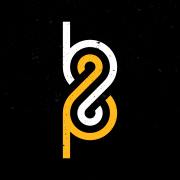 While nice, I feel like it's too traditional a design for Nashville. Makes me realize how much I miss those checkered jerseys. With more yellow in those things, they were easily one of my top 10 jerseys of all time. 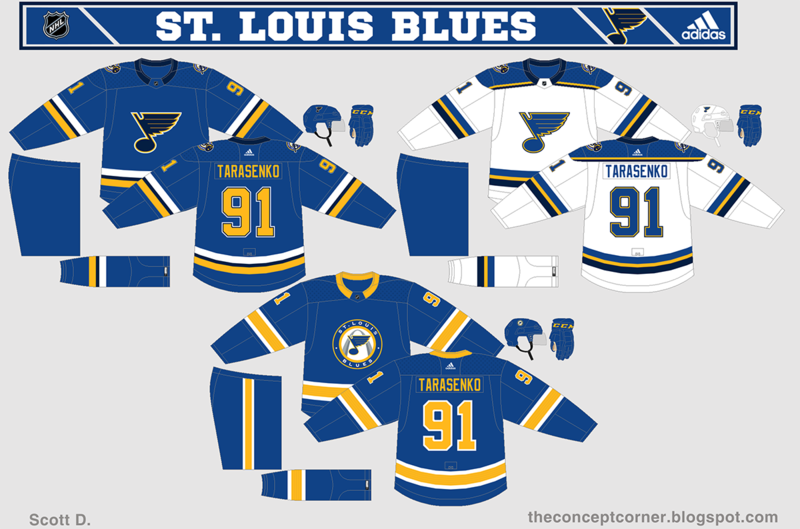 I'm digging the striping, but I think I'd swap the yellow and blue stripes on the road jersey. I'm also not feeling the number font at all, I don't think it fits Nashville. I'd stick with their current one. 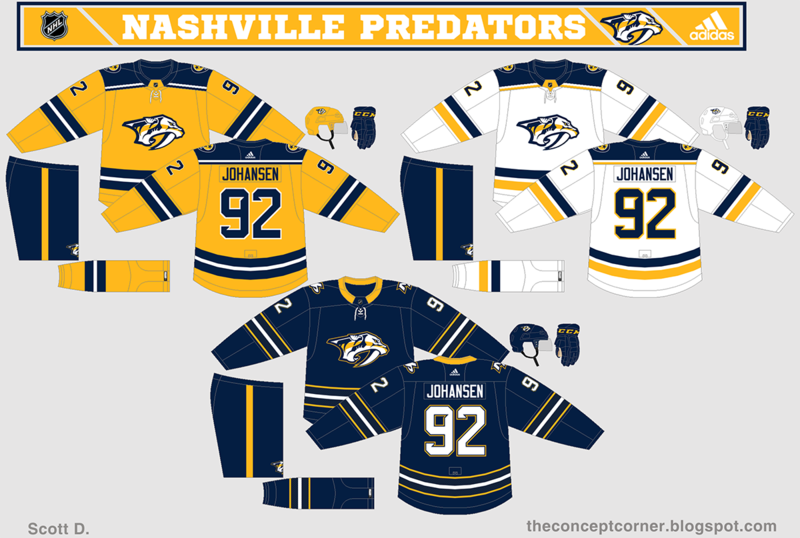 I like it, but will echo that it feels a tad too traditional, for Nashville. Navy shoulders don't work very well with the pick logo, I recommend a yellow outline, for them. The numbers need to go, as well. Their current ones should be brought back. The alternate is perfect, except for the checkerboard. The blue on black was a complete misfire, in motion. It was distracting, and made you feel like your eyes were playing tricks on you. It was even worse, in person. On top of that, the checkerboard has nothing to do with Nashville, a city with practically zero racing culture. I say to just ditch it. Set is inspired by their alternate from the early 2000s. Not much to say, set is inspired by the old Jets. Alright, sorry for the delay in posting the next team. Nothing major for Montreal. Added a matching road and an alt based off the primary. For the Coyotes I went with a more traditional look while bringing back an element of their original look. 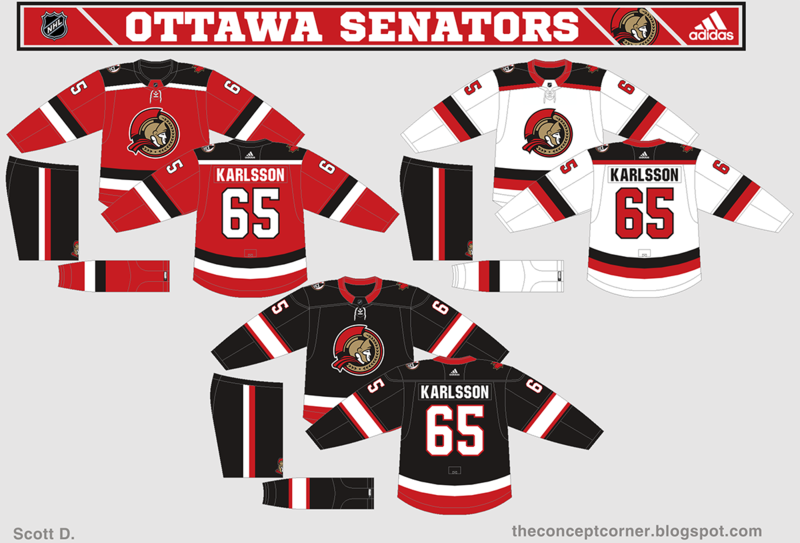 These are nice, the Kachina striping is really nice, got no complaints here. I love the Arizona set, it addresses two of my biggest gripes, with their look. The underutilization of sand, and the lack of their old striping. Bravo. Absolutely love the Islanders set. 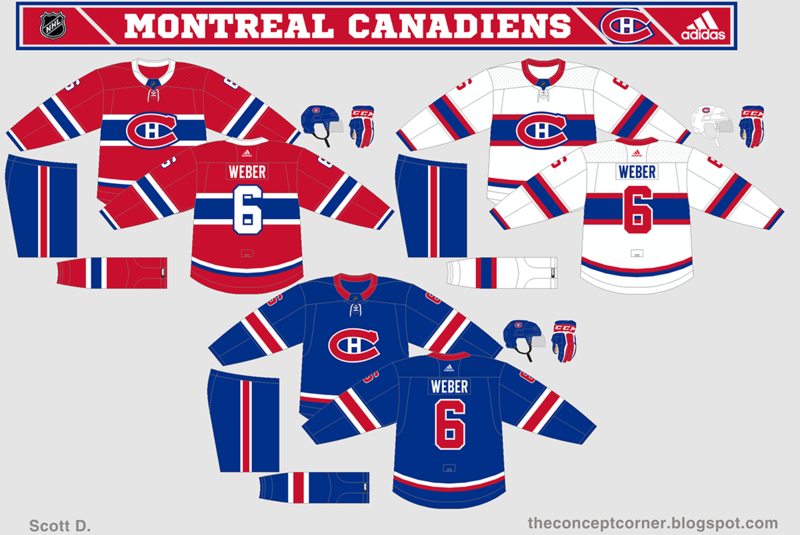 There was always something about their first Reebok uniforms that I liked. This combines them with their classic uniforms perfectly. The way the upper sleeves match the hem is brilliant. Get these on the ice now! Alright getting close to finishing up the league. Only Detroit and St. Louis (I believe) left to post after this next team. Series won't be over got a few revisits I have planned. Winter Classic and maybe some other stuff. On to the next team. 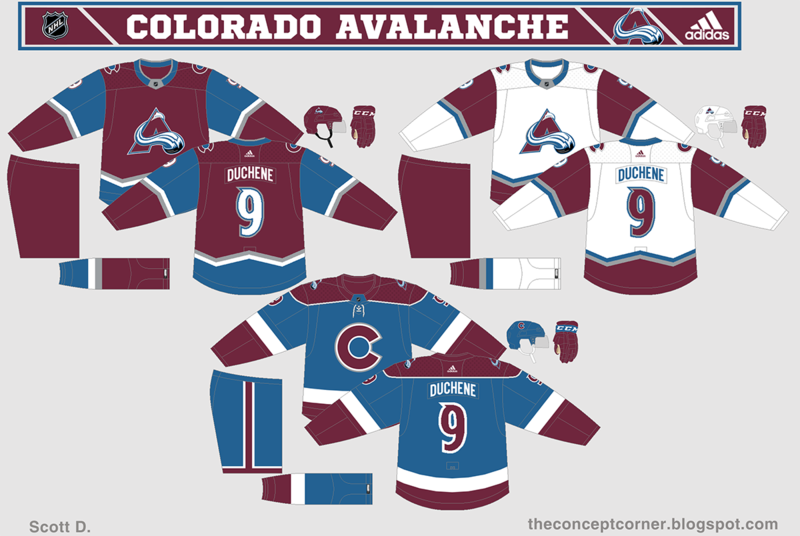 For the Avalanche, the primary is a mix of their classic look and their Stadium Series design. Alternate is a mixture of elements from previous alternates. 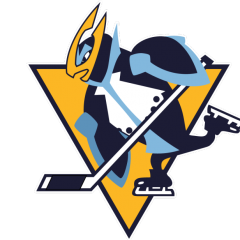 Also, I tweaked the primary logo a little bit. Nothing major for the primary set. 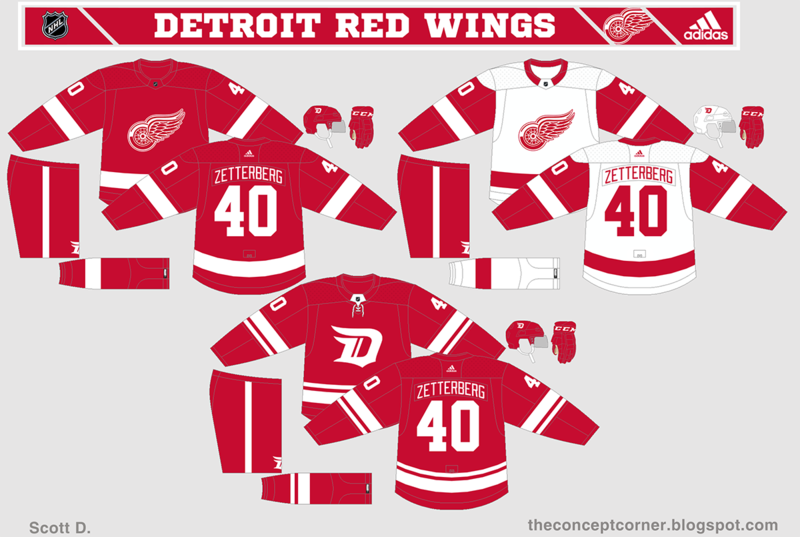 Added an alt based around the teams Winter Classic jersey from a few years ago. Alright, the last team on the run through the league. Revisits are coming. For the Blues, I went with a design inspired by the current sock striping. Minimized navy a little bit. For the alternate I brought back the roundel (which I always liked). Alternate also features sublimated lines. A nod to their look in the mid to late 90s.